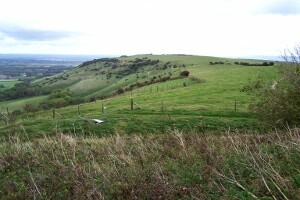 Ditchling Beacon is the second highest point on the South Downs National Park with spectacular views across the Weald. 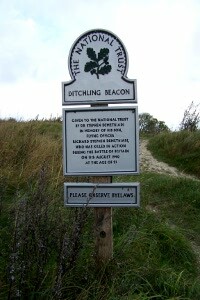 As the name suggests, Ditchling Beacon was one of the chain of fires lit to warn of impending invasions. It was once an Iron Age hillfort, with its steep northern slope used as a natural defence. 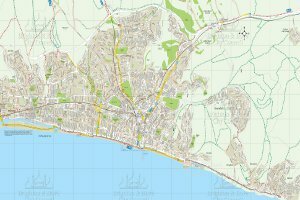 It’s now managed by The National Trust and Sussex Wildlife Trust. The 79 bus runs open-top bus services to the Beacon during the summer and at weekends. Breeze up to the Downs. Further information and timetables available from the Brighton & Hove Bus company. There is very limited parking available at the Beacon. With its walking trails and long views over the downs, Ditchling Beacon is as good for the experienced rambler as it is for a family picnic. There are no facilities available on site (except for an ice-cream van in the summer months) and due to its open nature, it can get quite windy, so wrap up if necessary. Two hectares on the north east slope of the beacon were given to the National Trust in 1953 as a memorial to Flying Officer Demetriadi who was killed in action in 1940. Demetriadi was one of "The Few", a term used to describe the Allied airmen of the Royal Air Force who fought the Battle of Britain in the Second World War. It comes from Winston Churchill's phrase "never was so much owed by so many to so few".